Due to SAP’s complex licensing environment, organizations are compelled to find ways to secure their SAP investments and manage their SAP licenses effectively. The essence of optimizing your SAP licensing is classifying each employee to the right SAP license type. This is crucial because there is a huge variance between the price of the basic “Employee Self Service” or “ESS” license type and the “Professional” license type, so a misclassification can result in significant additional costs. The challenges surrounding SAP software engines present a real dilemma for many organizations in terms of compliance and resources. Many overlook the fact that SAP licensing is not only based on license-per-user, but includes software engines as well. The SAP engine licensing model applies various methods for measuring engine usage, which are based on the actual data created in the SAP system. ProfileTailor LicenseAuditor easily enables organizations to assess their SAP engines, clearly understand which engines are actually being used and achieve best possible payment models, which are accurate and reflect the real usage of engines in the organization. Many organizations simply are not clear how indirect access are calculated, which leads to a huge financial risk. By using ProfileTailor LicenseAuditor, indirect access can be curbed and restricted. The tool allows organizations to model their current licensing situation easily, estimate their current exposure and financial risks from indirect access, and receive immediate alerts about new suspicious SAP data consumption so that they can inspect and stop unnecessary SAP access on the spot. Instead of a reactive approach that only addresses an expensive situation after an SAP audit, organizations can be proactive and maintain indirect access situations as they arise. While many organizations choose to classify SAP licenses based on theoretical calculation methods, ProfileTailor LicenseAuditor allocates SAP licenses based on actual usage and not by the structure of the organization, titles of employees or authorizations that are assigned in the SAP systems. ProfileTailor LicenseAuditor tracks the actual behavior and usage of each SAP user. Organizations can rest assure they will never be under or over licensed. The most suitable license type will be assigned to a user based on how much the user used the SAP system as a whole. The most suitable license type will be assigned to a user based on how much of the SAP system user has utilized. The most suitable license type will be assigned to a user based on how or according to which ways this user used the SAP system. Any combination of all of the above or any unique format requested by customer. Not sure if you are prepared for your next SAP audit? 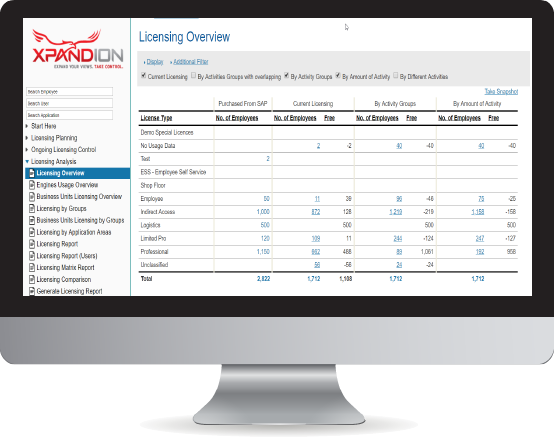 Let Xpandion right license your SAP environment in less than a day. Classify users based on their usage, optimize software engines and identify indirect access document license before submitting your SLAW report. Quick and easy with no installation required.